Admittedly, I never read — or watched — anything “Harry Potter” until six months ago. You’re right; I’m about 15 years behind the times, but I’m enjoying the books just the same. But if I had hopped on the bandwagon back in the day, I definitely wouldn’t have picked up on the layered lessons tucked into the words of each chapter — especially when it comes to personal finance. Wait, what? Harry Potter and personal finance? At first, the two might sound as contrary as a Basilisk and a Flobberworm. But as I flipped through the pages, my old English-major instincts kicked in: Of course Harry Potter can teach us about money. I started taking notes. Sure, some of these might be a stretch, but in a world of crunching numbers and tricky acronyms, Harry Potter can make personal finance pretty fun. So let me share with you the money lessons I’ve learned so far. Writer’s note: This post contains spoilers that’ll make you very, very sad to read if you haven’t finished the series. 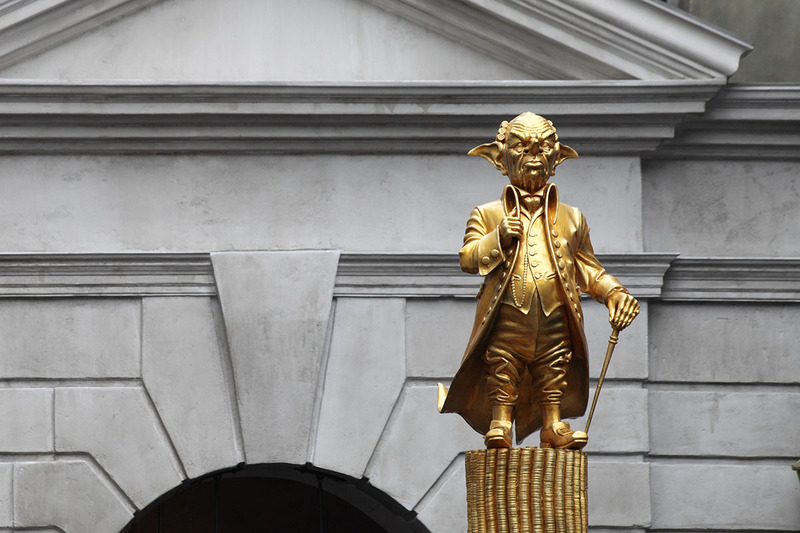 Gringotts Wizarding Bank is a pretty neat bank. If you remember in the first book, Harry Potter hops on a tiny, goblin-driven cart and is escorted to his vault, where his parents have safely tucked away a hearty amount of wizarding money. Now, we can’t all take a rollercoaster ride to find our stashes of inherited money, but there’s another bank I like that’s almost as cool. I opened an account because it’s all online, there are zero ATM fees (even when you’re exchanging Muggle money), and it offers 1% interest, which is 100% more than my other checking account offered. So, no, Aspiration isn’t Gringotts, but it is a safe place to stash away any amount of money you might have — from a hefty inheritance to your next rent payment. Hey, remember that one time Dumbledore hired yet another Defense of the Dark Arts teacher who didn’t work out? The time I’m talking about is when Alastor Moody came in to teach — but actually (spoiler!) it was Barty Crouch, Jr. who used the Polyjuice Potion to steal Moody’s identity. Fortunately, Muggles don’t have access to the Polyjuice Potion, but there are Nigerian Princes and other big-time scammers out there, so you’ll want to be sure to protect your identity and hard-earned funds. Major tips include protecting yourself while shopping online, setting secure passwords and using free monitoring services like Credit Sesame. By signing up for Credit Sesame, you’ll get free identity protection (and be insured for up to $50,000), your credit score, as well as free fraud resolution assistance. That way if anything does go awry — Polyjuice Potion or not — you’ll be alerted and able to take immediate action. Were you like Hermione, with a loaded class schedule? Unfortunately, you probably didn’t have the time-turner. But you probably did have the same ridiculous amount of heavy books. If you never sold them back after the semester, you can probably let go of them now. After all, if you’re anything like Hermione you just memorized that ish. We use a service called Bookscouter. You just type in your book’s ISBN, and Bookscouter lists the vendors that’ll give you the most money back. Hopefully you can pocket more than the $1.23 your campus bookstore offered. My mouth waters each time Harry gulps down Butterbeer. I haven’t even tried the real stuff at Universal yet, but I know it’s gotta taste better than that cheap domestic stuff I buy. But the Penny Hoarder in me is OK with that because I can really drive prices down on that cheap domestic stuff, which makes enjoying a cold beer at the end of a long week worth it. In addition to existing store sales and coupons, try using a rebate app like Ibotta. Scroll through the tons of rebates before you go shopping. Right now, Ibotta is offering $5 back on Shock Top, $2 back on gin and $2 back on certain wines (at my local Publix). If you prefer something more like chocolate frogs, Ibotta has rebates on tons of ice cream choices, too (including Halo, which is basically a low-calorie magical ice cream). After you select what you’re buying, take a photo of your receipt, scan the items’ barcodes and get cash back. Signing up is free, and when you claim your first rebate, you’ll pocket a $10 bonus. Wizards communicate long distances with the help of owls, but Arthur Weasley, who’s forever interested in the Muggle world, knows how to use Muggle phones. Basically, he knows not to shout into it. Coincidentally (for the point I’m making here), he also doesn’t have a whole lot of money. Nowadays, he could have taken $5 and started investing on that Muggle phone with an app like Stash. With $5 (which you’ll earn back when you make your first investment), you can start investing for the future (without making any high-risk moves; see No. 6 below). If you want more information, Penny Hoarder contributor Jamie Cattanach reviewed the app. In the “Goblet of Fire,” Ludovic Bagman, aka Ludo, pops in. If you’re going to take a bet, why not bet on yourself? And your health? We’ve written about HealthyWage in the past, an online program that allows you to bet how much weight you can lose. For example, we chatted with Healthy Wage user Teresa Suarez, who lost 68 pounds in six months. Even more, she banked $2,415.28. So if you’re down with taking a risk with your money, at least be smart — and healthy — about it. We’ve already established Ludo owes money from his lost bets, so goblins (basically our form of debt collectors) start chasing him. (Yeah, folks, Leprechaun gold doesn’t count.) That’s when he goes on the run and eventually loses his job at the Ministry. If you have debts, don’t wait until it ruins your life. The best thing to do is to face it head on. Pour yourself a glass of Butterbeer, and check your credit report. Don’t know where to find it? Try using Free Credit Report. It’s free, and so straightforward. It breaks down my score, what’s hindering it and where I owe money. So just face the goblins head on, and check out your credit report. Speaking of… Ludo scams many people with the disappearing Leprechaun gold. It looks just like Galleons, but disappears after a few hours. Ron learns this the hard way when he grabs a handful of the coins at the Quidditch World Cup and pays Harry Potter back for his Omnioculars. The coins disappear, and Ron gets embarrassed, though Harry insists it’s OK. The lesson here: If it’s too good to be true, it’s probably too good to be true. We constantly stumble across scams, so it’s best to educate yourself and protect your assets. Some common ones include work-from-home jobs scams, mystery shopping scams, phishing scams and phone scams. Anyway, the lesson here is: See if there’s a big event coming to your town. Real estate close to big festivals, concerts and sporting events is prime. Then, put your home, spare room, garage apartment or even a tent up on Airbnb. You can make bank. For example, this guy makes $1,380 a month renting out a backyard tent on Airbnb. The Weasleys, a family of eight, don’t have a ton of money, but they’re resourceful and know how to save. For example, Ron wears his brothers’ hand-me-downs, and Ginny shops at Second-Hand Robes for her first year. Thrifting is a great way to save some money. You can even make money by selling your old clothing. Before you go to a resale store and get 50 cents for those designer jeans, there are tons of apps out there to help you, including Letgo. It takes less than 3 minutes to create an account and post an item — which you price yourself. You’ll market to locals, too, so you don’t have to worry about shipping costs and logistics. You might even find a Gryffindor robe on there… we did. If you’re not a jokester, you can still start a business doing what you love, though start-up costs and loans can be a pain if you don’t have a wealthy friend like Harry Potter. Also, it’s exhausting and time-consuming, especially if you have a family. But there are ways to strike up online, work-from-home businesses with minimal start-up fees. You can take an online course in a specific trade, like bookkeeping, proofreading or transcribing. Each program offers a free introductory course, so you can see if this is up your (Diagon) alley. These three people followed through, and they’re seeing great work-from-home success. Embrace your inner Ernie Prang, and if you don’t know who that is, don’t worry. Even one of our biggest in-office Harry Potter fanatics forgot the brief mention of ol‘ Ern in the second book. He’s the Knight Bus driver — the one that picks Harry Potter up on Privet Drive and sweeps him off to the Leaky Cauldron. We don’t know much about Mr. Prang, but we do admire his honest work. Really, it’s the Wizarding-version of driving for a ride-sharing service, like Uber or Lyft. So if you want to act like Prang — but without Stan Shunpike the stickler dictating your schedule — then you can sign up to earn extra money! Mrs. Weasley makes all the kids’ Christmas presents (oh, those colorful sweaters) because she’s on a tight budget. If you’re already thinking about Christmas, we’ve got the DIY side of it covered. However, when it comes to DIY, you’ll need to make sure it’s actually more cost-effective — unlike these Pinterest fails. In the Wizarding World, you have to pass a test to Apparate. When Fred and George pass, they start using it in insignificant (or so it seemed) ways, such as walking down the stairs. Oh, and did you notice we made it through this entire article without mentioning He-Who-Must-Not-Be-Named? Doing that can’t be good for your finances.